Healthy Recipes: Low-Calorie Diet Weight Loss Foods - With Mevo bring home the widest collection of easy Healthy Recipes with over hundreds of Healthy Recipes in your kitchen and give your body the quota of daily essential nutrients it demands. 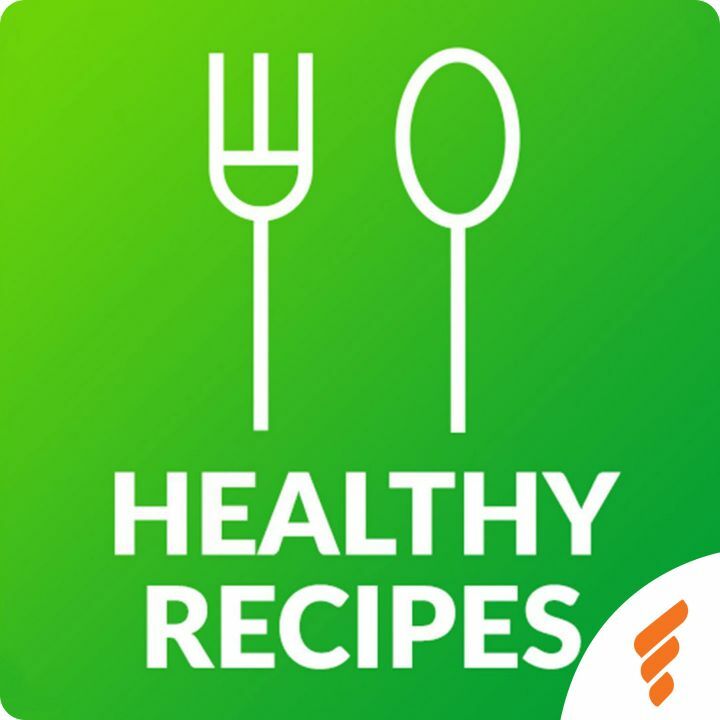 Healthy Recipes app is perfect for all those who hate to cook and those who love to cook with a wide list of easy 5-min recipes and exotic recipes for those who like to challenge their culinary skills. Start your day with a perfect healthy breakfast menu to devour your taste buds and indulge into a global cuisine experience. Now weight watchers won't have to stay away from delicious healthy meals anymore as Healthy Recipes bring you the exquisite collection of low-fat diets which are extremely low on calories but high in nutrients and essential requirements for the nourishment of the healthy body. Browse through a long list of healthy and easy breakfast, lunch, dinner, low-fat, diabetic, chicken, soup, rice, Indian, Chinese, Thai, Asian recipes and so on. 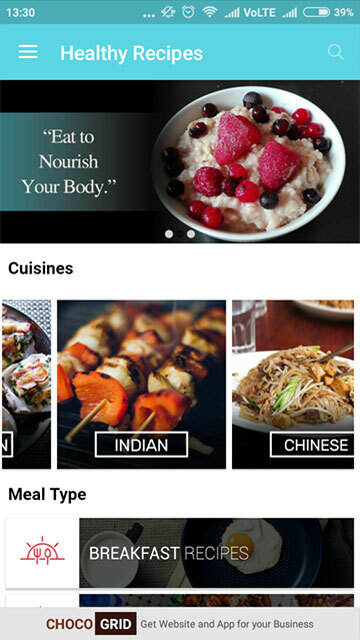 You are one step away from your perfect daily menu of delicious dishes to liven up your taste-buds and to take away the boredom of usual mundane food menu, install healthy recipe app to the most delicious drooling world of delectable, finger-licking recipes and show off your culinary skills to the world. 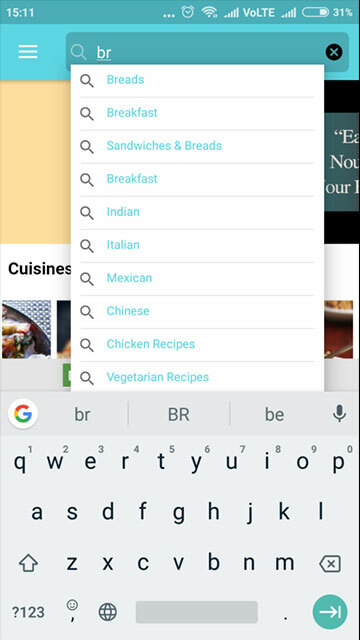 Oh and the list is endless, so you get a whole pack of world's most loved and famous recipes on your phone and at your fingertips. Now you can also make food just as delicious as your mother or grandmother makes without having to worry about your health and the gym classes you are taking. Well, we all fear trying out new cuisines because most recipes turn out to be a big failure and all our efforts and food goes to waste, but with Healthy Recipes, you can be fully satisfied and guaranteed that every recipe is first tried, experimented and then only it got publishes for a seamless, 100% genuine and delicious dish which you will love to cook by yourself. Break free your mind from the daily chaos of "what to cook today", step out of your daily boring meal menu and try out something new and delicious with limitless options to chose from on Healthy Recipes. We love to help people stay fit and in shape, so to help people achieve their fitness goals, Healthy Recipes have a special corner for those who are looking for great weight-loss recipes and a diet plan for minimum yet healthiest diet intake plan. Go ahead with your exercise routine, we are here to take care of your diet routine. Invite your friends and family for a dinner or brunch this coming weekend and surprise them with a full course meal having all the multi-cuisine varieties with a wide array of starters, main courses, desserts to make. Flaunt your culinary expertise with Healthy Recipes. With Healthy Recipes, you not only get the best recipes, but you also get the some of the best lesser-known tips and tricks about staying fit, healthy and making delicious food effortlessly. Holistic health and fitness approach is something we believe in and love to share with our users. On our official site http://www.healthyrecipes.org/ you can find the best trending articles on recipes and food world. Go through the collection of smackiest, easy and quick Healthy Recipes which will leave you in a state of taste hangover for sure. 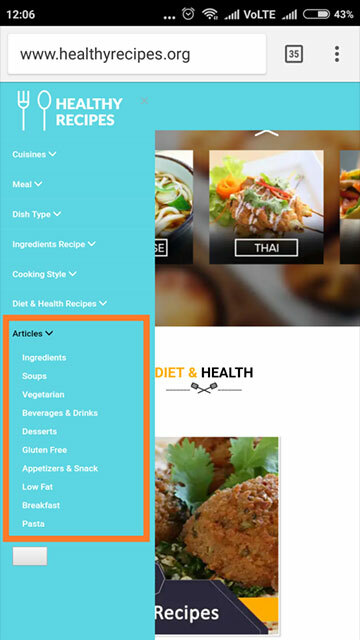 Be it hot or cold, sweet or spicy, deep-fried or oil-free, dessert or starter, discover all the info about your favorite food on Healthy Recipes. We don't like you have a tough time to go through a long list of endless recipes and still not able to find the perfect recipe that u might want to cook, so we have carefully designed Healthy Recipes with proper categories and method, so you can find your best recipe without any trouble. 8. Easy and quick recipes for those who neither likes to cook nor like to compromise with taste and health. Those who aren't good to cook or those who don't like to cook knows the pain of eating out daily, it's consequences on health and pocket. So get up and quit eating out if can cook delicious restaurant style food with some of the easiest recipes all by yourself without under 5-10 minutes. 9. Not only food, you can also make all the types of drinks you can think of with no hassle and easy recipes. How can a meal be perfect without anything to drink, take a glass full of protein-packed shake or icy cold fresh drink on hot summer days, and make everyday refreshing with a whole range of our yummy, healthy beverages. 10. Making quick snacks for your family will never get easier than this with easiest and delicious snack recipes to munch on. Sunday mornings could be really hectic as a result of never-ending snacking needs from kids, but why feed them something unhealthy when you make healthy, non-fried yummy snacks for your kids and family in no time with Healthy Recipes. 1. How to install the application? 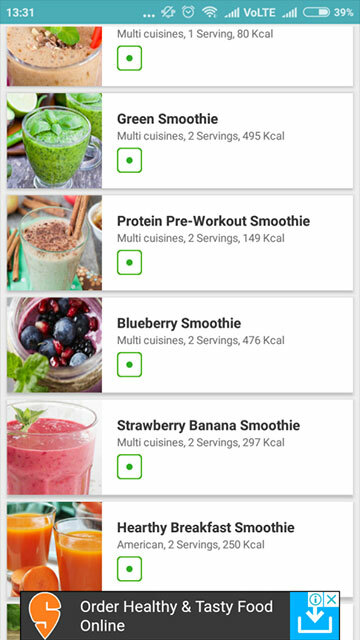 Click https://play.google.com/store/apps/details?id=com.mig.choco.mevo.top.android.org.healthyrecipes.healthyfoodforweightloss.app&hl=en and install Healthy Recipes app on your phone and install this yummy application to get started with your healthy lifestyle and daily fitness routine. 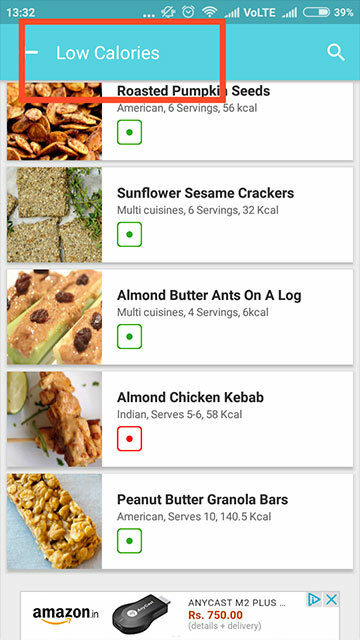 Healthy Recipes is one of a kind app to have all the global cuisines, desserts and beverages at one place with the lowest possible quota of calories. 2. How to stay fit along with a healthy diet and a fitness routine? After a great meal, it is the time to follow the full fitness routine along with diet instructions through this app as offered by MevoFit. Since we are very strict with your health, so we also provide you Mevofit which help you keep moving and burn off any excess calories and keep you in shape and stay healthy. 3. How to the find the recipe that you are looking for? 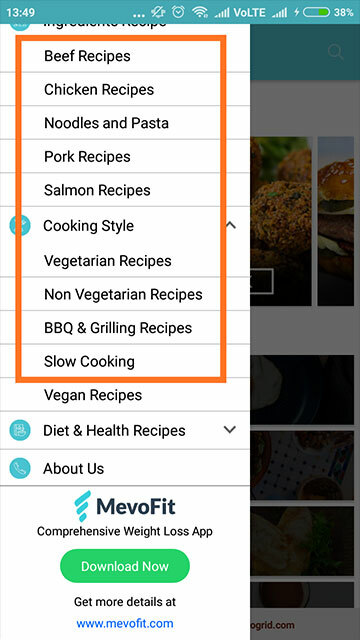 Chose your favorite category of dishes from cuisines, Meal, Dish Types, Ingredients Recipe, Cooking Style, Diet & Health Recipes and much more or simply hit the search button. Select the dish that you want to make from the list. We understand that no one likes the mundane boring daily menu for dinner, so we have made hundreds of options which you can try with your regular ingredients in no time to spice up your food-life by handpicking the selected categories and options of recipes for you. 4. 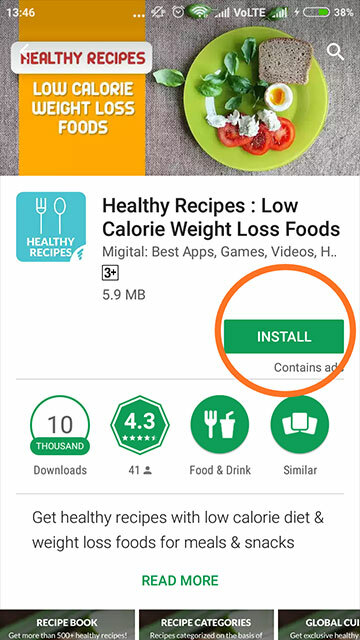 How will healthy recipe app help me lose weight? Remodeling the recipes to fit anyone's budget without having to compromise with the quota of nutrition. Replacing expensive and harmful synthetic protein shakes with natural, cheap homemade healthy protein shakes and drinks. Proving you full weight-loss programmes including workout routine by MevoFit along with a custom weight-loss programme for overall health goals. Using readily available ingredients to help you save the struggle of finding the selected expensive items for a weight-loss diet. 5. How to follow the recipes and make the dish? Learn from our easy recipes step by step guide to make your recipe with readily available ingredients so that you don't need to run any cooking videos. Our recipes follow clear and easy steps with enough explanation to save you from any confusion of what to do next and how to do. All it takes to cook a meal with us is to follow the steps carefully. 6. How to get more tips and tricks on healthy lifestyle on Healthy Recipes? To get more stuff on a healthy lifestyle, you can follow us on healthyrecipes.org for more fun recipes, tips, and tricks on a fitness routine and lots more to explore. 7. How can healthy recipes help you if you don’t have time to cook in your busy schedule? With easy and super quick 5 minute recipes, healthy recipes make sure that you won’t have to compromise your health because of your busy schedule. You can cook surprisingly healthy and delicious meals for an energy-packed active day with your daily ingredients in 10 minutes. So never compromise on health again. 8. 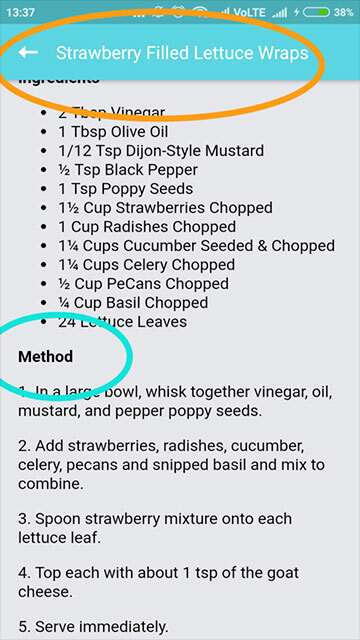 Is there anything else that anyone needs to know about using Healthy Recipes application? That's all you need to know and you are good to start cooking the most healthy and delicious dishes and it's time to impress your friends and family with your hidden culinary skills with our easy Healthy Recipes. Want some more useful Health & Fitness Apps? Try Lose Weight Fast App for your Android/Apple phone now.